National parks and private game reserves in Southern Africa that are ideal for family safaris with young children. Addo Elephant National Park, originally closed-off in an effort to stabilize elephant populations in the Port Elizabeth area, is now the third largest national park in South Africa. The park extends to the coast, and whale sightings are frequent year-round. Great white sharks and southern right whales are the most frequent marine visitors. In addition to marine-life, South Africa’s second largest African penguin colony can be seen catching fish along the coastal borders of the park, along with albatrosses and seagulls that take to the air for the same goal. The park houses a vast and diverse variety of life. All big game on the usual list can be sighted here, along with around 50 of the threatened black rhino species. Shamwari is most notable for its consistent conservational efforts and has been regarded as a leading figure globally when it comes to conservation. The park prides itself in keeping the wilderness wild and preserving and even rehabilitating wildlife where necessary. The reserve’s strong support of conservation projects, like the ‘Born Free Foundation,’ is reflected in the beautiful landscape and wildlife on show there for all guests and visitors to take in and enjoy. The reserve is privately managed and the lodges found within 250 square kilometers are few, offering a tranquil atmosphere in which to relax, some 75km from the nearest city buzz. Sossusvlei, from a distance, seems like a lifeless pan surrounded by the arid Namib Desert in the south of the Namib-Naukluft National Park in Namibia. However, looks can sometimes deceive more than we might anticipate. The area is surrounded by red dunes that seemingly go on forever in every direction. 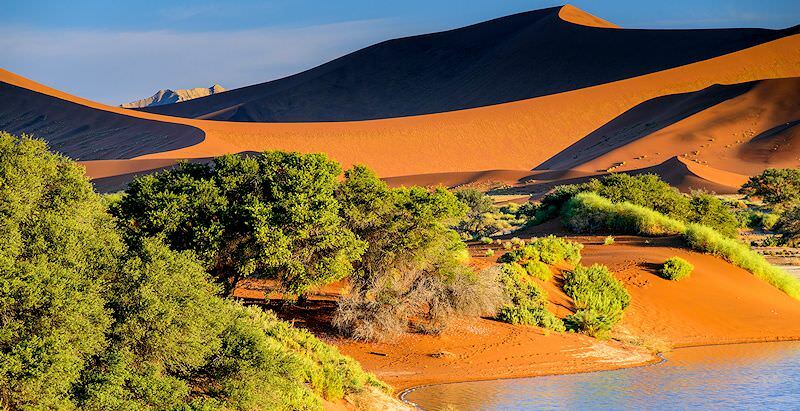 These dunes are among the most sought-after in Namibia for their height and shape, making them perfect for all kinds of activities that will surely bring the daredevil out of you. In addition to the activities, the scenery in nearby Deadvlei and Sesriem Canyon are a photographer’s dream, with brilliant colors and a silent window into a world that has been around since before antiquity - an amazing contrast to the ever-shifting dunes. Entabeni, meaning ‘place of the mountain’, may confuse you if you’ve laid eyes on some of the great mountain ranges of the world, but to the locals of the Waterberg area of Limpopo in South Africa, the area is considerably mountainous. This is yet another private reserve outside the areas pestered by malaria. The reserve is a short drive from the city hubs of Pretoria and Johannesburg, but is as wild as they come. Elephants are among the larger animals found here, along with leopards, cheetahs and buffalo. The reserve is another prime example of the power of conservation. For years this area was depleted of its natural diversity and beauty as farmlands edged ever deeper into the Limpopo region. The damage has clearly been undone in recent years. Welgevonden is the second private reserve on this list found in the Waterberg Biosphere Reserve. The reserve is home to the Big Five, a great variety of birds and a host of luxurious and extremely hospitable lodges and camps from which to take in and enjoy this beautifully conserved area in the north of South Africa. Welgevonden, like Entabeni, is around the corner from Gauteng’s city life and OR Tambo International Airport, making it more accessible and a hit among eager travelers who prefer not to stray too far from civilization, or as a first stop on a more elaborate journey through the pristine wilderness of Southern Africa. As conservation and environmental efforts by both governments and private owners grow, places like Madikwe Game Reserve are born. The park surrounds the basin of a river for which it is named. The reserve is almost on South Africa’s border with Botswana, in and amongst many rural communities and areas of the North West province. The park sustains lots of bird and mammalian life, again not far from Johannesburg and its airport. Furthermore, the park is very close to the Pilanesberg Game Reserve, and current developments might see the two parks merge at some point in the near future. 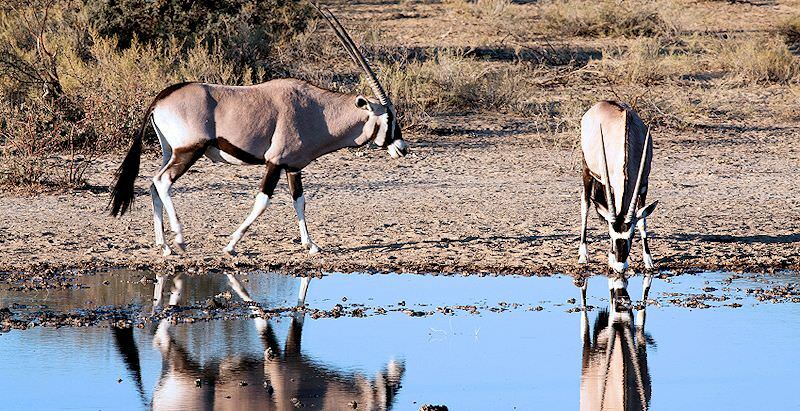 The Kgalagadi Transfrontier Park is one of Southern Africa’s largest and is shared between two conservational powerhouses in Botswana and South Africa. The park is one of few in Botswana that is malaria-free and includes a large portion of the Kalahari Desert - one of the oldest in the world alongside its neighbor the Namib. The idyllic scene of a clan of meerkats upright in the morning sun is a regular sighting during a Kalahari sunrise. Furthermore, some of the largest lions and antelope in the whole of Southern Africa can be found here, driven to their great size and stature by the harsh conditions here. The only other member of the Big Five that is present is the elusive leopard, while cheetahs and both brown and spotted hyenas make up the rest of the major predators. Birds of prey also call the area home, and thanks to the largely treeless terrain, are easier to encounter. Pilanesberg Game Reserve ticks all the boxes in the run for an ecological dream and a great park for locals, city-goers and tourists alike to visit and enjoy. The park, as is customary for the bigger game reserves in South Africa, supports all five members of the Big Five. The tag team of black and white rhinos in the park are one of the main attractions, along with the history - particularly anthropological history - the park conserves in addition to its biodiversity. There are a few scattered sites dating back to the Stone and Bronze ages that serve as evidence of early man’s presence in the area. The area later formed part of Tswana communities and farmlands with evidence of an 18th century town in the area, the same people that today dominate nearby Botswana and have major populations Gauteng.